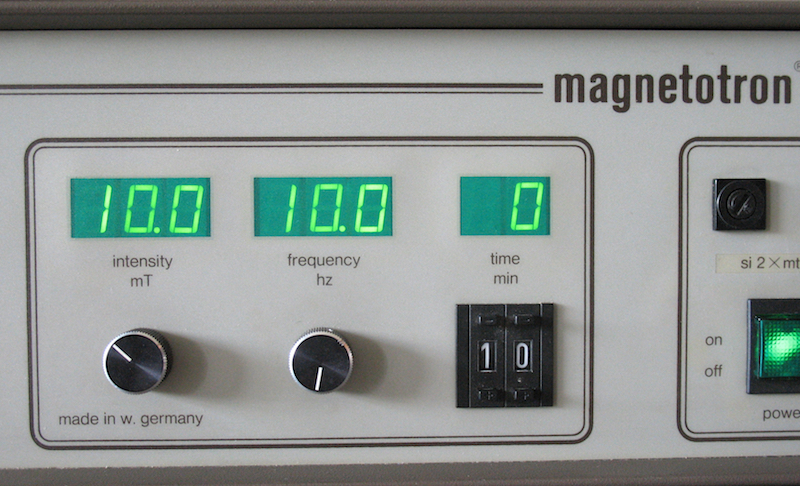 Pulsed Electro Magnetic Field (PEMF) therapy devices emerged halfway through the 20th century. One of them was the elec system Magnetotron. In this blog I put it in the spotlight. Recently I bought a Magnetotron manufactured by elec system in the early 1980s. The previous owner was a Dutch physical therapist who used this vintage PEMF device succesfully for many years in his practice, mainly to treat non-union fractures. In case this is new to you: there is ample scientific evidence that pulsed magnetic fields can stimulate bone growth. (Also there are several FDA approved PEMF devices for this indication.) The Magnetotron is a medium intensity professional PEMF device for local application – in human and veterinary medicine. German company elec system launched their first series of PEMF devices in 1974. For the development they cooperated with Universities in Germany, Italy and the US. 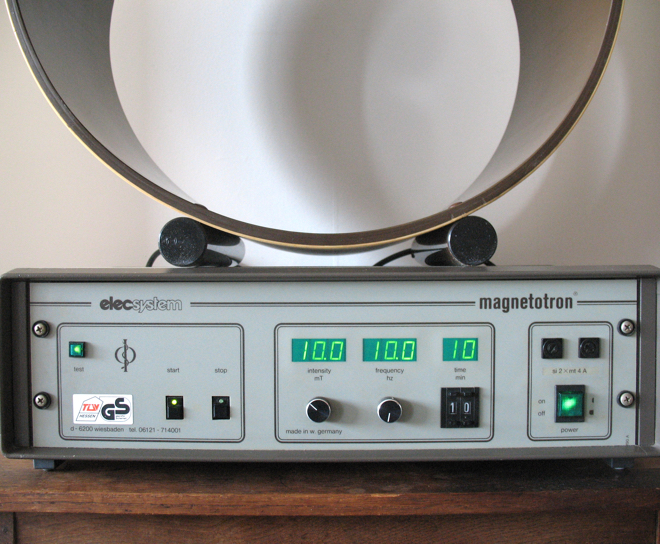 Throughout the seventies and eighties their devices like the Magnetotron, Biopulse and Vitapulse, were used in clinics, hospitals and physicians’ offices worldwide. They were also (one of) the first to combine PEMF with infrared light therapy (a.k.a. Low Level Laser Therapy or Photobiomodulation). The company still has a website, but it hasn’t been updated for a while. The main designer and constructor of elec system was Manfred Fichtner. As an inventor and pioneer he filed several patents for magnetic field therapy devices in the 1970s and 1980s. One of them was for a combined magnetic field and infrared device in 1985. 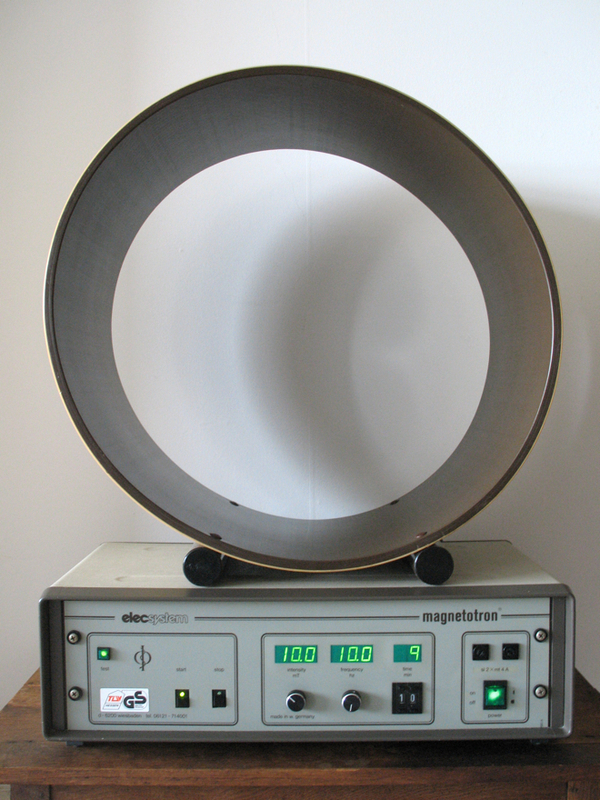 Typical for the Magnetotron is its cylinder (or barrel) shaped coil for applying the magnetic field. Nowadays few PEMF manufacturers still use the cylinder coil. The reason is that the magnetic field is weak outside the coil, so only parts of the body can be treated. Also it isn’t practical to get a patient inside the coil. The cylinder-coil applicator may be outdated, but I’m happy to have one in my PEMF device collection. I agree the Magnetotron is a heavy and hard to handle device, unfit for full body treatment. Nevertheless it is a good applicator for treating the abdominal and chest cavities. Also for the treatment of pets – as it can be tilted to form a basket in which you can place cats or small dogs. There have been various models of the Magnetotron. The one I own (type m-90-p) has a nice late seventies retro look that goes well with my living room. There are both older and newer versions with different designs. The price generally ranges from 50 – 2500 dollar. They are not easy to find, but you may get lucky through Ebay Germany. If you do, chances are it will still work, because of its robust build. Whether you want to treat yourself or others, the Magnetotron can still be a nice tool in your box – even though it’s almost 40 years old. * Although the operation is fairly easy and self-explanatory, I’m still looking for the original elec system Magnetotron manual. Preferably in English, but the German one is welcome too. I will make it available as a download, once I get hold of it. * Any info regarding the elec system Magnetotron and its history you can provide is welcome and will be used to update this blog. Accessories included: handle & magnet to sense the magnetic field - both not in the photo's. 2. elec system company brochure from 1986. 3. This article by Ben Philipson of PEMF manufacturer Curatronic. 4. Correspondence and conversations with William Pawluk of drpawluk.com. 5. Review article ‘PEMF applications: A corporate perspective‘ from the Journal of Orthopaedic Translation (vol 9) 2017. 6. Book: ‘Power Tools for Health: How Pulsed Magnetic Fields Help You’ by Msc William Pawluk MD & Caitlin Layne.